Well I have thought quite long enough about this project. Now it is time to stop looking at the fabric and get on with the project. 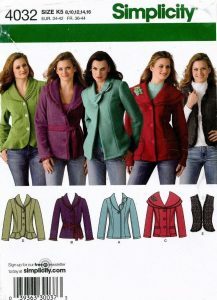 First step was to trace off the pattern from Simplicity 4032. I used the back, side front, front panels and centre panel/facing/collar pieces from view D. To remove the hem flounce I added 3+5/8th inches to the length of the pieces whilst retaining the gentle curve at lower front edge on the centre panel/facing/collar pattern. I adjusted the centre back by 1 inch for my sway back and added extra width at the hips – ‘just in case’ it was required. I am pleased that I checked out the faux fur and discovered that there was a definite nap, all pattern pieces were laid so that the pile was going down the garment. 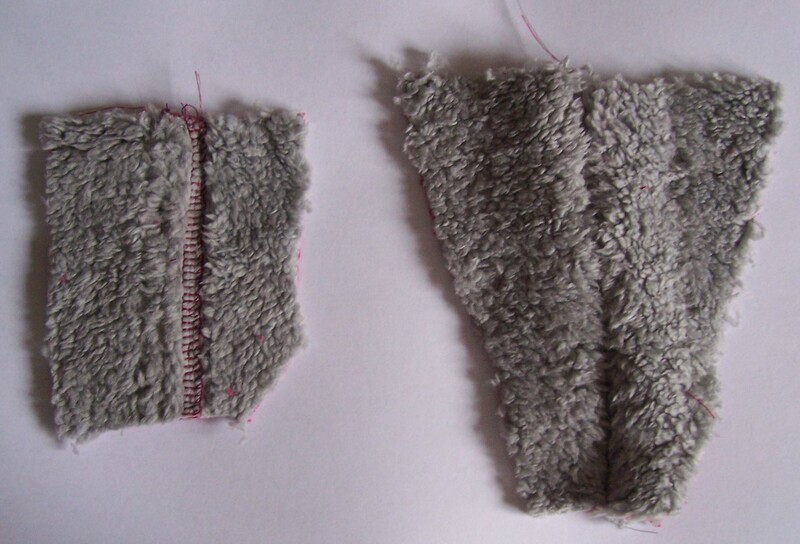 I used some spare fabric to run a couple of stitching tests. Was I going to have the fur on the inside or the outside? 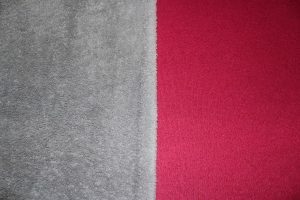 I decided to have the faux fur on the outside so that the smooth knit was next to my other clothing and would reverse at the collar giving my face a frame of the Cerise Pink colour. I tested out seam finishes. Option 1) Lapped seams with all seam allowances overlocked in the Cerise Pink thread – preferred. 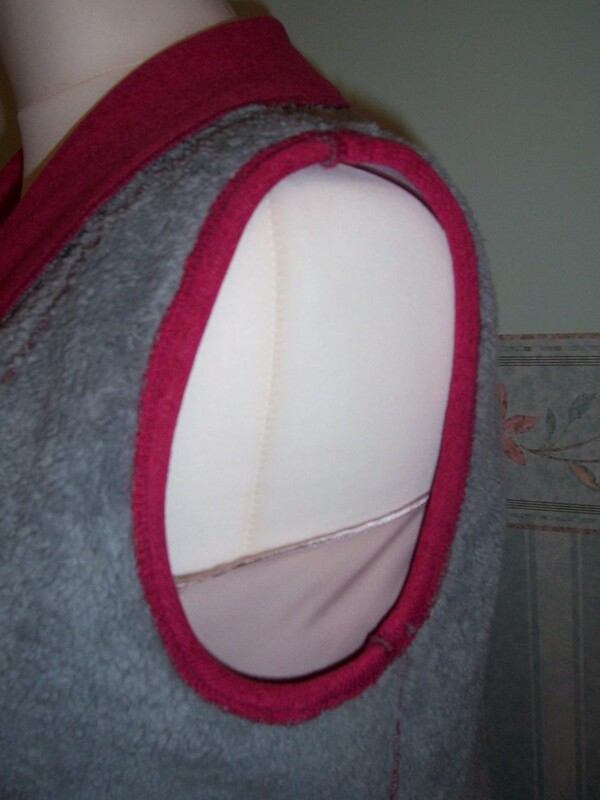 Option 2) a straight forward seam with Right sides together – not good as that left a lot of raw/fluffy seam allowances on the inside of the gilet. I threaded the machine with a Light Blue Grey in the needle and a Cerise Pink in the bobbins. All seams were stitched from the Right side. For the first fitting I pinned all the seams to check the fit. After some adjustment of the seams I then stitched each one twice. First to secure the top layer in place and secondly to secure the under layer and prevent it from flapping about inside the garment. 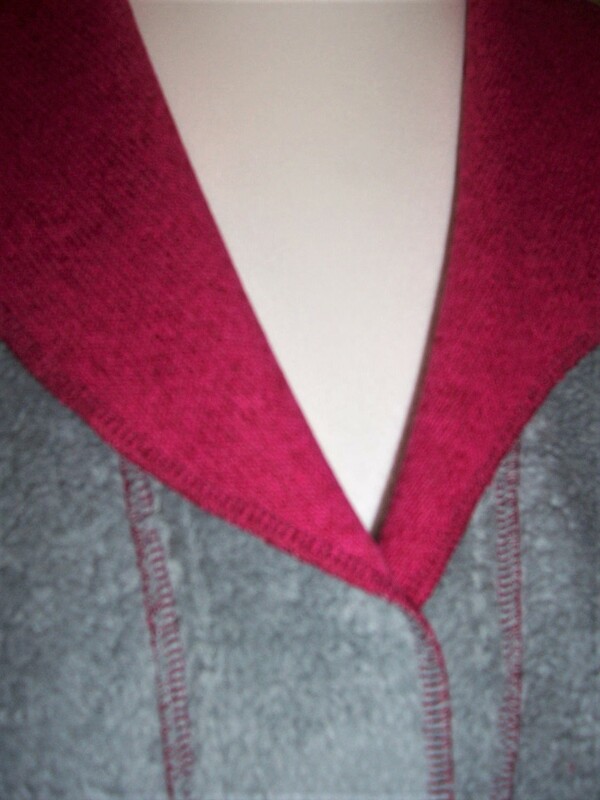 This method gives a nice smooth finish to the inside of the garment thus making it easier to put on and off. For the armhole finishing I simply overlocked the raw edge and then turned the knit side to the outside before hand basting in place. 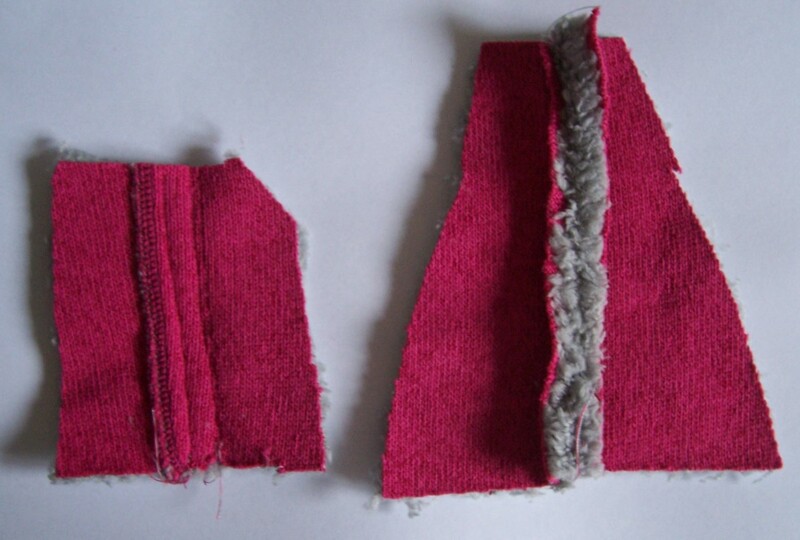 I changed the top thread to Cerise Pink before zig-zag stitching the turnings in place. The front panel/facing/collar piece was also applied using a lapped seam and finished in the same way as the other panel seams. The entire outer edge was then overlocked to finish the raw edges. The gilet is big enough to lap right over left and could have a button or snap fastening but for now I will leave it as is. 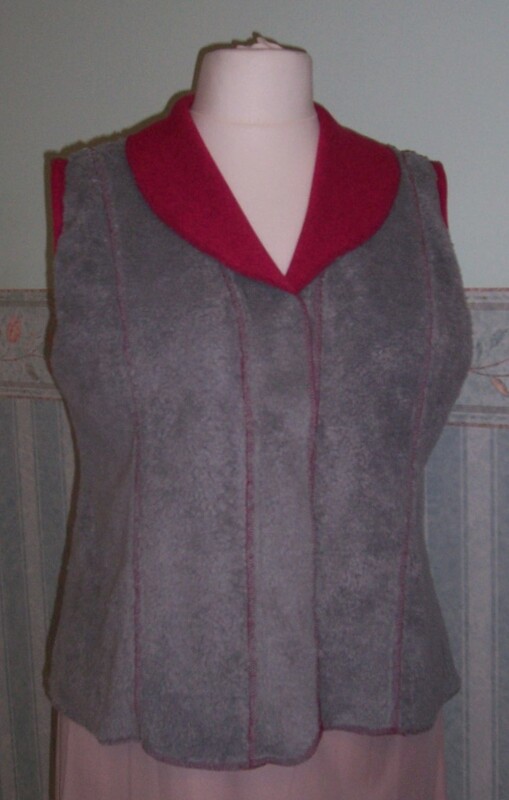 A very comfortable gilet which has provided me with the new experience of sewing with faux fur. 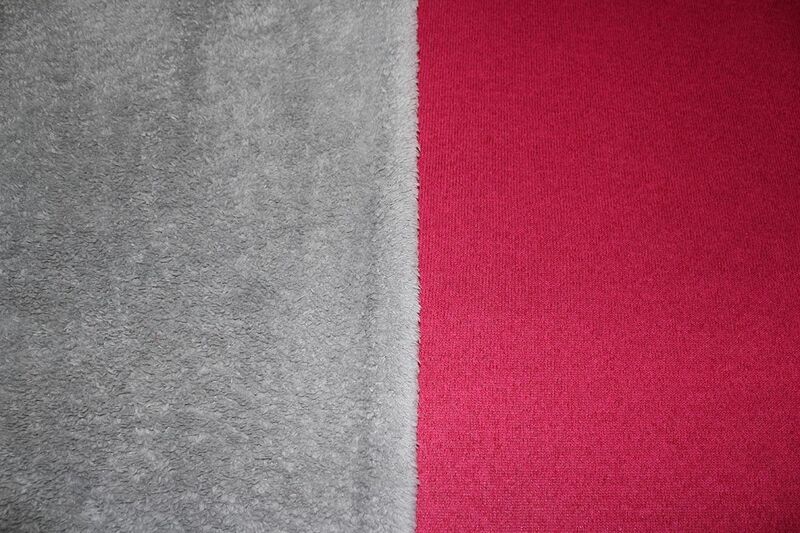 Now I have to vacuum the sewing room which is awash with Grey fluff!